Here are some more infos on what original characters Capcom based their fighters on. This page is about real people and invented game/comic/etc characters. 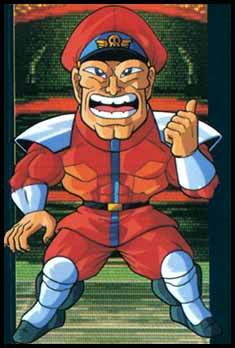 E. Honda of SFII looks a lot like Kabuki, a character from Nintendo's "Armwrestling" (an arcade game released in 1985 and related to the hit game "Punch Out"). They're both Japanese sumo wrestlers and both have red face paint (like Kabuki characters in the Japanese theatre). This game is available as a rom file for MAME (only legal if you own the arcade). 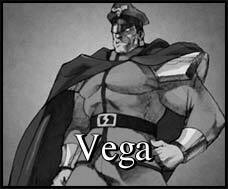 Vega (aka M. Bison in the Western World) shares the dictator look with many other Japanese characters. 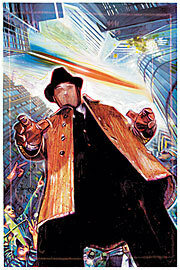 Take a look at the Steet Fighter II' CE art and the cover of the DVD Doomed Megalopolis! 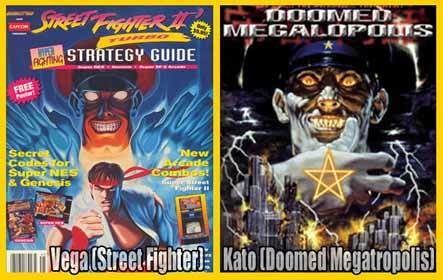 Kato of Doomed Megalopolis and Vega of Street Fighter II are two villains with lot's of similarities. They both got the 4 letter name, the hat and the glowing eyes. After SFII The Animated Movie and the SF Zero/Alpha series, Vega was depicted mostly very muscular. In SFII he was thinner, more like Kato. I'm quite sure that the SF II' drawing was meant to look like the DM cover, just compare the way ears, mouth, eyes and the hat were drawn. Kato looks just like Vega except for the symbol on the hat. Vega used to have such a star on his hat instead of the skull with wings he has now (which is the symbol for Shadaloo). You can see it on earlier designs and also in SFIIWW (see below). Here's a video with some pictures of Kato (manga and real live). Notice how Kato used to have a Katana to kill his opponents, typical for an imperial officer. It is now associated more with Washizaki. Vega is never depicted with one unfortunately. Washizaki is another manga character with the same look. Washizaki is from the famous manga Riki-Oh aka The Story of Ricky (that was also produced as an anime show and a popular very violent slapstick/martial arts movie. This Japanese website has some more pics and infos, check it out! See how the poses and the backgrond match Vega from SFII? Here you can see Washizaki in the anime (YouTube.com). 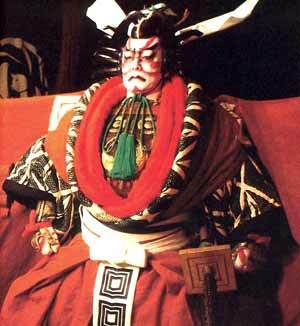 Washizaki seems to be based on Kato from the live action movie DM, since he has the big chin like the actor and sports the star/pentagram symbol. Vega seems to be based on both characters. 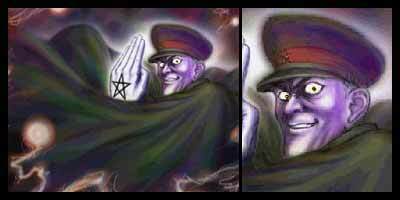 Rudolph von Stroheim (of manga/anime JoJo's Bizarre Adventure) is a Nazi who wears an SS uniform similar to Vega. He has a skull and wings logo like Vega (more on Vega and the Nazis in the Various Info setion) and comes back after being killed as a bionic. He also has a high tech base like Vega. 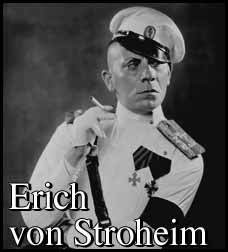 The name von Stroheim seems strange at first, as the most famous person with the name was a Jewish film director (Erich von Stroheim). Giving that he played villainous German roles in various movies during WWI, it makes sence though. Note: Capcom has based other characters on JoJo's BA characters and has released a Street Fighter like 2D fighter of the series. 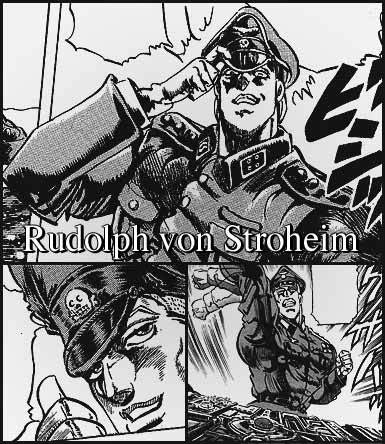 More on JoJo's BA and von Stroheim further down the page. 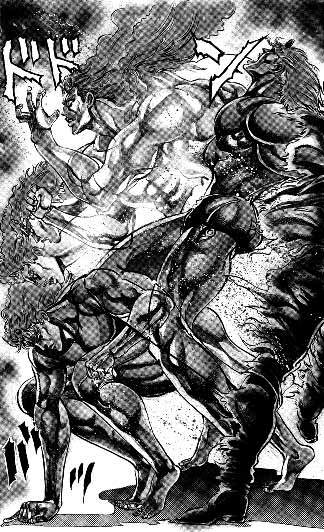 Another inspiration might have been Brocken Man (or Blocken Man or Brockenman, depending on how you translate from Japanese) of the wrestling manga/anime Kinnikuman. Unlike the other inspirations mentioned, he already has the skull and wings combined into one symbol. Sometimes he's also shown with just a skull logo though. The toys were sold in the US as M. U. S. C. L. E. but the Blocken Man toy was not sold in the Western World, probably because he was a Nazi with swastikas on each arm. The picture is from this website with more information on the toys. Apparently MUSCLE stands for Millions of Unusual Small Creatures Lurking Everywhere. Brocken Man has a son named Brocken Man Jr. who has a similar look and was one of many fan submittions to the Kinnikuman series. Here is a video that shows him performing high jumps, flips and head stomps like Vega. SNK Zantetsu put together this comparison. Another Lookalike is The Leader, a dictator boss character from Capcom's video game Bionic Commando. Both illustrations to the left were done by Shinkiro. 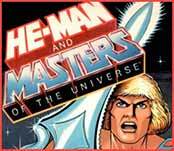 Ken's family name might be based on famous cartoon, comic and toy hero He-Man. When Capcom first released GIJoe Street Fighter figures in the US, Mattel forced them to make up a second name for Ken, because he might be mistaken for Barbie's betrothed Ken. Until then his name was just "Ken". Of all names in the world they chose Masters. 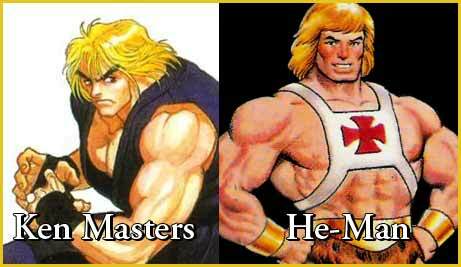 At that time The Masters Of The Universe (often just called "Masters" by the fans) were Mattel's other big seller and their muscular main character He-Man (aka wealthy Prince Adam) had medium long, blond hair just like Ken of Street Fighter. I doubt that this just happened by chance. 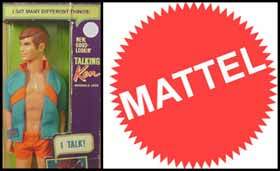 Maybe they wanted to make fun of Mattel. While the other name changes (Ryu Hoshi, Chun Li Xiang, etc.) only appeared in American non-canon products (toys, cartoon, Van Damme movie) the family name Masters was included in the official Capcom canon and the Masters became a world famous family of billionaires in the Street Fighter universe and were pictured more than anywhere else in the non canon anime series Street Fighter II V.
Cammy is highly influenced by Gally of the Japanese manga series Gunm ("Gun Dream") also known as Battle Angel Alita in the Western World. But because of the different hairstyle of Cammy and the original, many don't recognize it, eventhough both characters are quite well known. The best site I found about this topic is CammyFan.com (the number one Cammy fan site). Most of the info posted here about Cammy and Gally is from there. Both seem young, have big eyes, suffer from amnesia and have artificial bodies making them super soldiers for their organizations. Cammy, who first appeared as a brainwashed human in SSFII, got turned into a Shadaloo experiment involving Vega/M Bison's DNA when she returned with her new outfit in SFZ2A/SFA2G and SFZ3/SFA3. Gally has a human brain but a robot body. They were similar suits with no arms and Cammy's gloves look a bit like Gally's hands. They also share very similar fighting moves. Check out CammyFan.com for a detailed list. 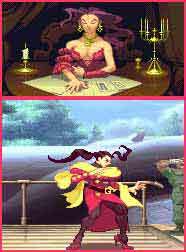 The Shadaloo Dolls of SFZ3, which are basically reuses of Cammy's design, could be based on Gally's clones. While the Dolls have months as names (in different languages), numbers from 1–12 in German are given to Gally's clones. Both have slightly incorrect names by the way. Only in the US version Juni is a robot. More on inspirations for the Dolls on Rip Off Page 5. 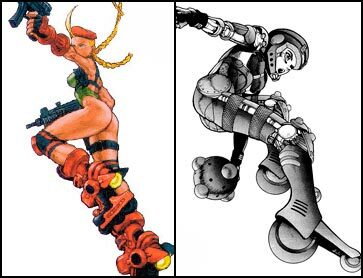 Even Cammy's appearance in the non-canon shooter Gunspike/Cannon Spike resembles Gally. In this game Cammy is the leader of the Anti Robot Special Forces. The Indian Yoga master of the movie "Master Of The Flying Guillotine" has stretchy arms like Dhalsim. 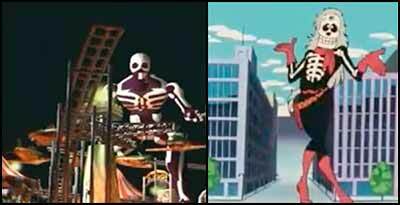 (left: Dhalsim's SSFIIX ending; right: a scene from the movie "Master Of The Flying Guillotine". 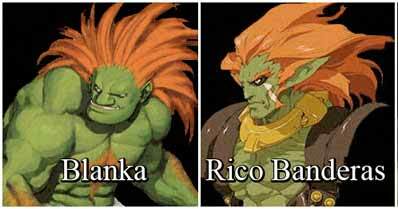 Rico Banderas of Xenogears might be based on Blanka's design. Same skin color, same hair color, pointed ears, metal bracelets. 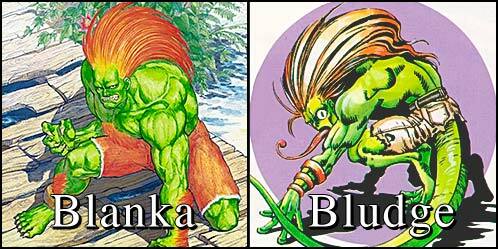 Both Blanka and Bludge start with "Bl". The enemy character from Capcom's side scroller beat em up Cadillacs and Dinosaurs also has green skin, orange hair, metal bracelets and ripped shorts. Kan-U (aka Portor) from Capcom's side scroller beat-em-up Warrior's Fate, the sequel to Dynasty Wars (original title Tenchi wo Kurau II: Sekiheki no Tatakai) has a similar lariat move as Zangief and Haggar and their pile driver is used by Chou-Hi (aka Kassar) from the same game. 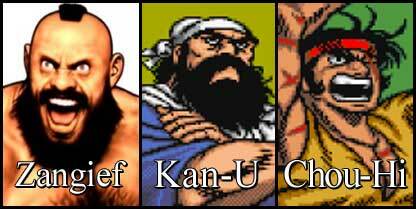 Kan-U has a beard like Zangief, Chou-Hi has similar scars. We also know this ability from other characters such as the T-1000, the "evil" robot of the movie "Terminator 2" with Arnold Schwarzenegger. When he turns his hands into blades they look a lot like Twelve's weapons in SFIII 3rd Strike and he consists of a liquid-metal-like substance that can turn into solid stuff and can copy other people, just like Twelve. I remember an old post on SRK mentioning that Twelve's design was based on an alien that appeared in an old Japanese TV show. The episode it appeared in was rather infamous for some reason (can't recall at the moment), and it just so happened that it was the Twelfth episode of said show... hence Twelve's name. Could this be said alien? It certainly resembles Twelve, the show is called Ultra 7. Summary of episode 12, which was banned from Japanese TV. 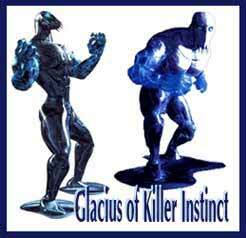 Now there already was a character in a Beat Em Up game just like Twelve (also a rip off of the T-1000): Glacius from Killer Instinct. Twelve looks a lot like Glacius, they are both able to form their arms and legs into weapons (ie blades). 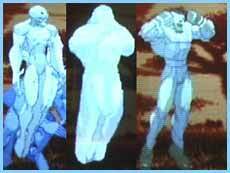 So Twelve could be named "the Glacius of Street Fighter". Twelve might also be based on EVA of the popular Japanese manga/anime series Neon Genesis Evangelion. They have similar movements and abilities. Skullomania of Arika's Street Fighter EX is an ordinary salesman who suddenly becomes a super hero (might be just in his fantasy). In SFEX2 he got a redesign and now features a red cape/ribbon and a belt similar to the Kamen Rider/Masked Rider characters in addition to the letter S on his forehad and some minor changes to ephasize his Henshin origin (Japanese TV heroes). He might also be based on luchador La Parka aka L.A. Park (video) who also wears a skull dress. He's obviously slightly chubbier than Skullo but has similarly weird wrestling moves. Kinkotsuman of the Japanese wrestling series Kinnikuman (MUSCLE) has even more in common with Skullomania from SF EX2 on. His name means "Muscle and Bone Man". 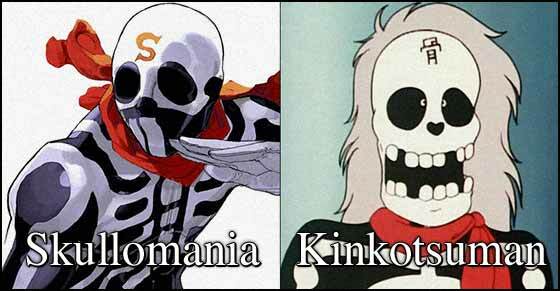 Besides the red scarf and, the writing on the forehead and of course the skelleton look, Kinkotsuman's moves might have been a main influence on Skullomania too. As you can see in this video to his Theme, he tends to spin around in a similar way. 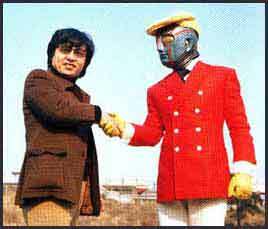 In the same video Kinkotsu man is as big as a building. 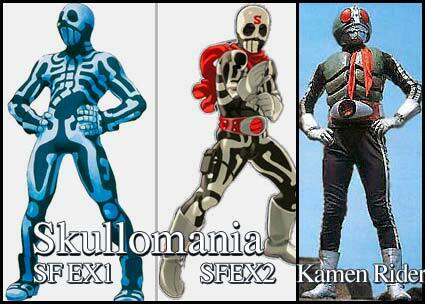 In his SFEX1 ending Skullomania grows into a huge hero fighting a big robot character. Not sure if that has anything to do with Kinkotsuman as it happens in many Japanese series. This is something else I knew absolutely nothing about but people told me bout it and I also read about it in Tiamat's Plot Guide so I thought I just had to put it up. Yup, pretty obvious that Yun with his baseball cap and braid is based on Duo and that Yang with his extreme spikey hairstyle is based on Trowa. Don't know if they are twins, too. Yun, like Duo, is more carefree. Yang, like Trowa, is serious. If you know more about them let me know. 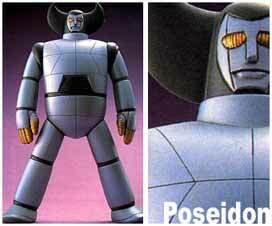 Street Fighter III Thrid Strike character Q might be based on Poseidon from Babel Nisei by Mitsuteru Yokoyama. They have the same yellow eyes, the same metal face and the same lines going from the eyes to the bottom of their faces. They have the same mouth, too. On the pics you can see Poseidon stretching his arms away like Q when he loses through a time out (zombie style). It's not clear wether Q is a robot or part robot or not a machine at all. His neck can be seen in the game and it looks like usual skin. From the same manga a character named Iron Mask has the same face and a "detective look" like Q. 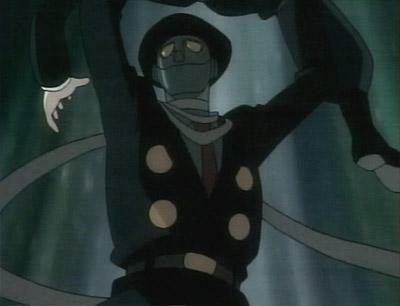 In the anime to Giant Robo, also by Mitsuteru Yokoyama, a female character disguises herself as Iron Mask. More Giant Robo rip offs on the next page! 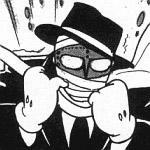 In Mitsuteru Yokoyama's other manga named Tetsujin 28 there is another character that looks like Q (mask and tie, coat, hat, gloves). His name is Kelly. Kelly, a man who replaced his own body for a mechanic one in order to live long enough to carry out a project which involves flying into space, which is also Kelly‘s dream. However, Kelly goes berserk during heavy lighting storms, causing him to malfunction and kill Dr. Dragnet (the man he assisted in the space project and turned him into a robot) and another fellow scientist. Of course, he can’t parade around as a robot so he disguises himself as a human (the appearance of his former self) with clothing and fake skin (though he does covers his own face up with bandages and wear gloves). Kelly also weights heavily, though he doesn’t seem to have any problems moving around. I read on several sites and forums that Q is a rip off of Tekkaman but this must be a mistake. Tekkaman looks nothing like Q (see pic below) and has nothing to do with him or any of the other characters shown here. I don't know how that rumour came up. 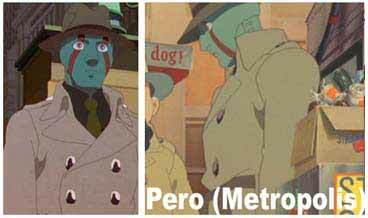 Now for Pero (or Perro) , the robot detective from Metropolis (the manga and anime, not the city DC's Clark Kent/Superman lives in). He really looks a hell lot like Q (who looks like a detective, too). The Metropolis anime was based on the manga Metropolis by Osamu Tezuka (creator of Astro Boy and many other classic series) who was inspired by a poster of the old German real live movie Metropolis by Fritz Lang (black/white). "The anime was changed to be more like the original movie. Perro himself was not in the original Metropolis manga, although he was still a Tezuka manga character. 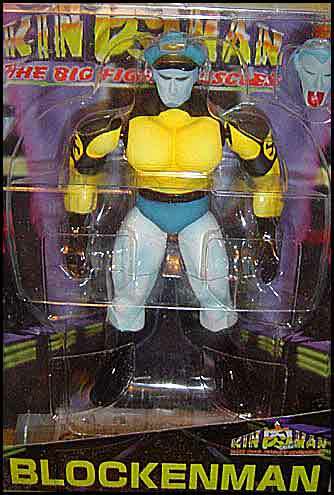 He instead appeared in the Astro Boy manga. He was originally a dog named Perro (owned by the character Mustachio/Shunsaku Ban) who was turned into a cyborg. In the Metropolis anime, as a nod to this, Mustachio/Shunsaku Ban is the one who names the robot Perro, after a dog he once owned. I should also note that Yokoyama (who did Babel II and Tetsujin 28) and Ishinomori (who did Robot Detective) were both once assistants to Tezuka, and they all draw in a similar style and created stories using similar concepts (which is why they all have Q type characters). I don't know which Q character came first, but his appearance seems most similar to the Iron Mask and Kelly characters created by Yokoyama (the design that was later used in the Giant Robo anime, which is based on the various works of Yokoyama)." Here you can see Q and Pero right next to each other. As you can see they wear the same coat, hat, gloves, tie and even the masks look a lot alike. The eyes and the color of the mask are different, but you can see the lines going from top of the eyes down the face. "The robot Pero questions why humans always use violence to resolve issues." This doesn't really fit to Q, rather to Remy. Maybe he was an inspiration for him, too. I also read that the creator of Pero named him after his dog, who finds everything (the detective aspect again). Again we have the yellow eyes, the metal face and the lines through his face from top to bottom. As the name says he's also another detective roboter. By now I'm sure that the presented characters are somehow rip offs of each other, not sure what the first one was but Ultraman and Robot Detective K both have this typical Asian Power Rangers style. 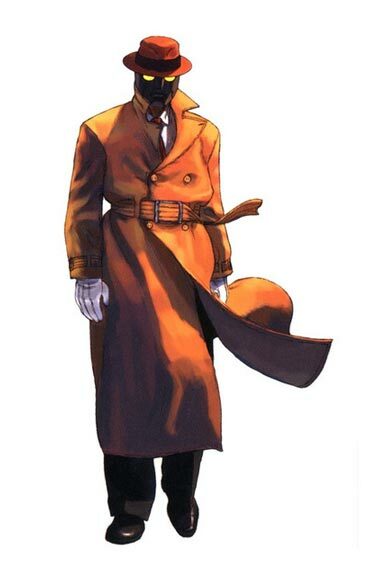 An American inspiration for Capcom's Q could be "The Question" also called just "The Q" by DC Comics (Batman, Superman etc). Not only the name but also the look is the same except for the mask. "Vic Sage is a journalist that is always able to break the tough stories, thanks to his activity as the Question." Brian Fury of Namco's Tekken and Urien of Capcom's Street Fighter III 2nd Impact have similar hairstyles and hair colors. They're both caucasian with brown skin (before fighting, Urien turns darker with white hair). Both could be influenced by Roy Batty of the hit movie Blade Runner. Unlike Roy and Brian, Urien doesn't have a scar though. Take a loot at the pic below. Both have wings, are blue (at least half) got long hair and don't wear a whole lot more than what you could call underwear. And the hair color is not that different either. Are there more similarities (storyline)? Tell me if you know it. 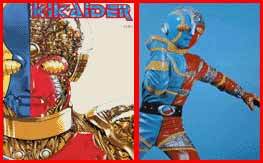 Sano from the Shoryuken.com forums said, that Udenko (of Udon) said, that Capcom designer Shoei said (*sigh*), that Gill was based on Japanese action hero Kikaider who is half red/half blue just like Gill (except for Gill being red on his right side and Kikaider on his left side). 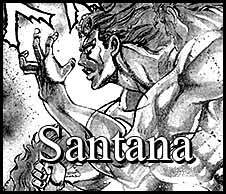 Gill might also be based on Santana of JoJo's Bizarre Adventure, with a similar look and abilities. I've seen some fanart that shows him in the same colors (blue skin, golden/blond hair) but I couldn't find any color images of him (send that in if you want). More JoJo's Bizarre adventure info below. But that's not all. 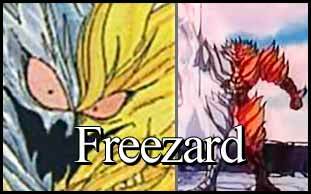 We also have Freezard of the manga/anime Dai No Daibouken aka Dragon Quest. He's half blue half orange and controls Fire and Ice, just like Gill. And even in the Marvel universe (Thor) there is a villain looking like Gill who "has found a way to escape death". 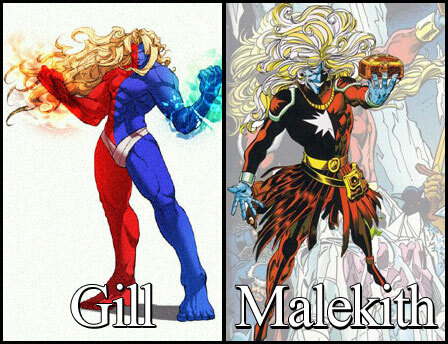 His name is Malekith The Accursed and his face his half blue/half black while his body (clothing) is half red/half black. Could be interesting to see the two in a crossover game. As described by BigMex in his "This is not Street Fighter IV" series, Gill is most likely influenced by or based on Geegus of ADK's Street Fighter rip off "World Heroes" (also mentioned above in Vega's entry). 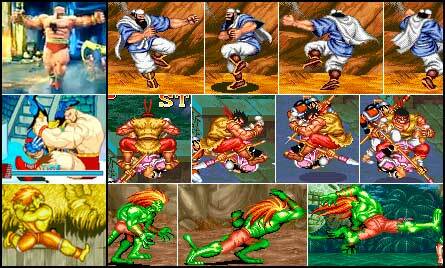 It seems that Capcom's way of revenge for all the copying is to copy characters back from SNK and ADK. Of course the ADK characters Geegus and Dio are based on other manga/anime/game characters. "Geegus was superior to the player in every way, he was humanoid whose final stage would raise the themes of the ragnarok / armageddon. This character also had a contemporary in the series named Dio. Think of the relationship and similarities between Gill and Urien." "Geegus" sounds like "Jesus" and I remember reading somewhere that the development team of SFIII feared that Gill might have too much in common with Jesus (diapers, messiah etc). As if that wasn't enough, I also got a possible Gill inspiration on Rip Off page 5 from Hokuto No Ken. Rose who first appeared in Street Fighter Zero 1 is based on "Lisa Lisa" of "JoJo no Kimyo na Boken" or "JoJo's Bizarre Adventures", a manga (book and anime) series of which Capcom also made a streetfighter-like 2D fighting game (entitled "JoJo's Bizarre Adventures") available for Sega Dreamcast and I think also for other video game systems. 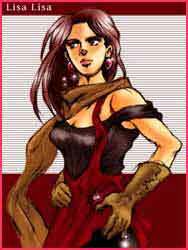 Not only Rose's look but also her fightingstyle are based on Lisa Lisa's. Main character JoJo meets Lisa Lisa in Venice, which is also Roses SFZ2 stage. Description: Lisa Lisa is a master at Ripple technique. Don't think that she will go easy on you just because she is a women. She trained Joseph and Caesar mercilessly. During her fight with Wired Beck, she used her silk to send a ripple and kill him in one hit with Wired Beck not even realizing it. During her final fight with Kars, she was wounded but she was able to recover from it. Rose seems to not only be based on a character from JoJo's Bizatte Adventures but also Doomed Megalopolis (just like Vega is based on Kato). The scene in her ending of SFZ2, where she's shocked by the sight of her tarot card, seems to be quoting a movie scene with a tarot reader. 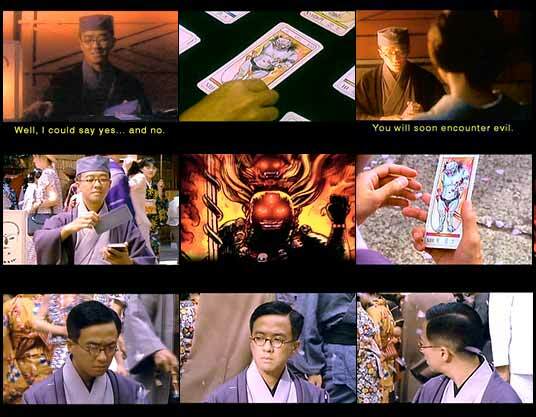 Basically at the end of the live-action film, the fortune teller is looking over his cards, when a fierce wind hits, knocking off his hat and sending one of his tarot cards flying out into the street. He chases after it, picks it up and flips it around...but the image has changed to that of a demon! He looks up in some shock and confusion while in back of him, Kato disappears into the crowd...The scene's of course not played out exactly the same, but the idea is exactly the same. They think that Kato is gone forever, but the tarot cards suggest otherwise, and we get to see the evil guy one last time before the credits roll. Guile's most striking feature is his weirdo hairdo. But Lieutenant Rudolph von Stroheim, mentioned earlier as an inspiration for Vega, had the same hair style before. 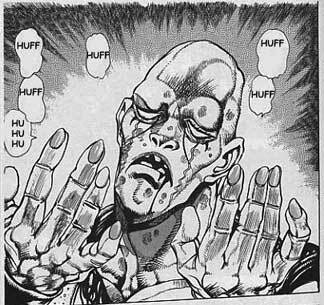 It's obvious that Capcom took another idea from the manga JoJo's Bizarre Adventure. Although the characters have nothing else in common, the scans below should be evidence enough. 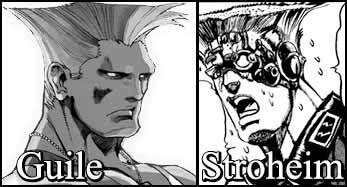 Jean-Pierre Polnareff has an equally crazy hairstyle that seems to be the main influence on SNK's Benimaru Nikaido. Both Guile and Benimaru appeared in the Capcom VS SNK crossover games. Even his name "Guile" could be based on a character from JoJo's Bizarre Adventure: One of Polnareff's opponent's name is J. Geil who's name is based on The J. Geils Band (with the lead singer John Geils). Jolyne Kujo of JoJo's Bizarre Adventure: Stone Ocean was probably the role model for the hairstyle of Juri in Super Street Fighter IV. Her clothing style looks similar too. SFII's psychopathic Spanish bullfighter Balrog (aka Vega in the Western World) hates his ugly father who killed his beautiful mother. Dio of JoJo's Bizarre Adventure hates his father who talks bad about his dead mother and who Dio says, has worked his mother to death. Both Dio and Balrog are depicted with roses, more pictures coming soon. 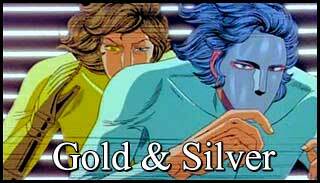 Gold and Silver, the twins from Golgo 13 The Professional, have a lot in common with Balrog. They are "Bishonen", a typical type of male manga character with a feminin beautiful look. They are assasins like Balrog. Silver wears a mask just like Balrog. While Gold has a golden glove, Balrog has a golden claw (at least sometimes it is depicted golden as you can see below). Their fighting style is somewhat similar to Balrog's and they also do the very high screaming. Now this one right here might go a little too much into speculation, but there is a third assasin (by the way, all three of them are quite sick sadistic individuals, like Balrog). His name is Snake and he always wears purple (top to bottom) and moves like a snake and Balrog has a big tattoo of a purple snake all over his upper body. Incidently, some scenes with Balrog from the anime SFIIAM seem to be quoting scenes with Snake from Golgo 13 The Professional (more on this in the future). Two characters from Saint Seiya might have been an inspiration for Balrog. 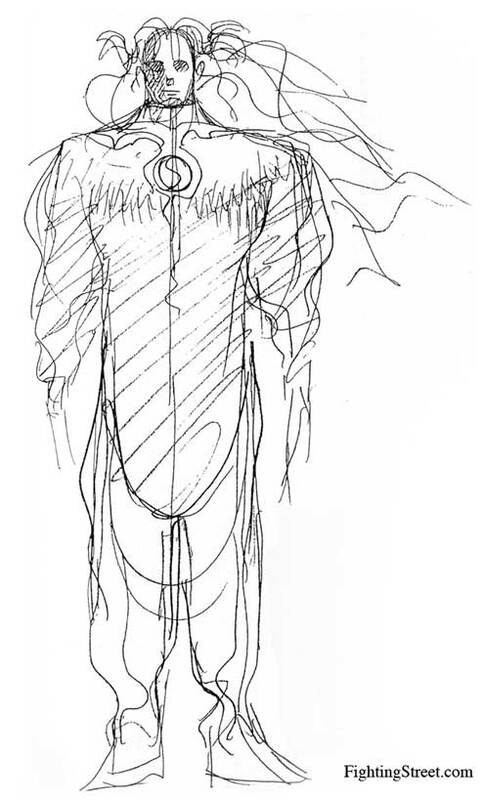 The first one is Eligol, a fast, murderous villain who wears a similar white mask and uses his claws. He also screams a lot while attacking. Click here for a part of Saint Seiya – Warriors of Armageddon featuring him. 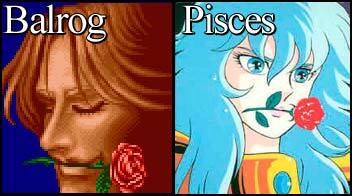 The other one is Pisces Aphrodite who's also a cold hearted narcisstic killer. Both like to carry Roses in their mouths. Coincidence? In movie Project A (Part 1) Jackie Chan fights a Kung Fu pirate named San-Po who has a big tattoo going all around his body, wears similar pants with yellow stripes and has a thick red belt. He seems to have been an inspiration for Balrog, too. and if you know more inspirations, lookalikes or rip offs, send me a mail.